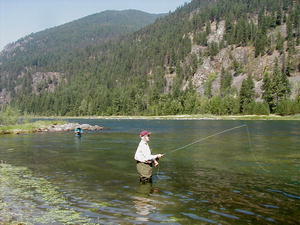 Kootenai River The Kootenai River flows through Libby and Troy and offers Blue Ribbon trout fishing. Scenic Kootenai Falls and Lake Koocanusa Reservoir are two of the many attractions along this mountain river. The Kootenai River near Libby. Photo by Maggie Craig. 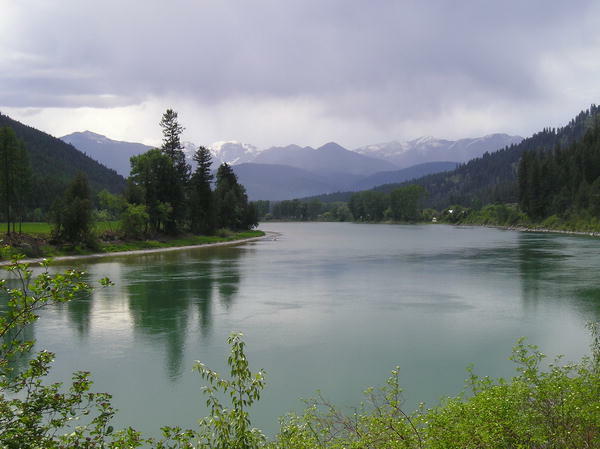 The Kootenai River has its origins in British Columbia's Kootenay National Park in Canada. From there it flows 485 miles into northwest Montana and through the towns of Libby and Troy. From there it flows into northern Idaho, then back into Canada and Kootenay Lake. Ultimately it joins with the Columbia River. Sixteen miles north of Libby, the river is held back by Libby Dam, creating a 90-mile long reservoir called Lake Koocanusa which reaches into Canada. 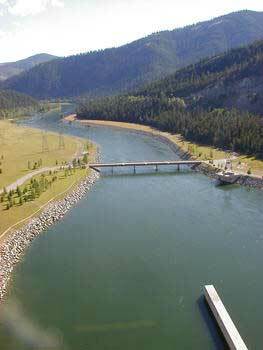 The Kootenai River is the second largest tributary to the Columbia River in terms of runoff volume, third in terms of drainage area. 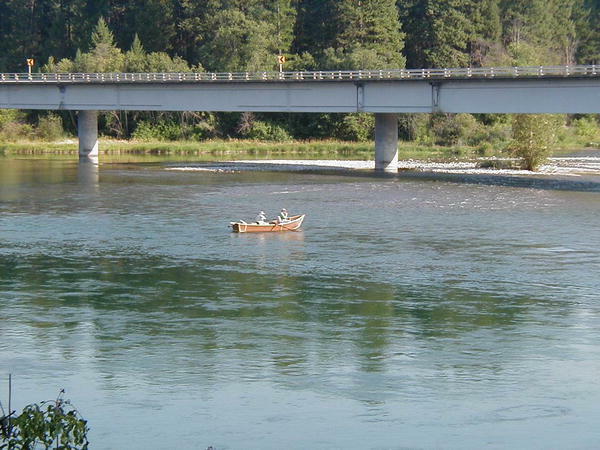 The major tributaries of the Kootenai River are the St. Mary, Bull Elk, Fisher, Yaak, Moyie, and Slocan Rivers. The Kootenai Basin is largely mountainous and dominated by three major ranges. The Rocky Mountain Range and its offshoot, the Flathead Range, constitute the eastern boundary; the Purcell Range roughly bisects it from north to south. The Selkirk and Cabinet ranges mark the western boundary. Elevations reach a maximum of about 12,000 feet with most summit elevations between 6,000 and 7,500 feet. Except for a few areas, the entire watershed is heavily forested. The Kootenai River supports populations of westslope cutthroat trout, bull trout, Kokanee salmon, and rainbow trout, among other species. White sturgeon also inhabit the river below Kootenai Falls. Libby Dam, completed in 1972, altered the river by controlling both the timing and volume of flow, as well as nutrient and sediment loading, affecting the aquatic ecosystem above and below the dam. Some species have thrived under these conditions, while others have suffered. Water quality within the Kootenai River basin is generally considered high and the river is considered to be a blue ribbon trout-fishing river, providing exciting sport fishing action. The drainage contains a wide variety of insect life, resulting in prolific hatches throughout the season. 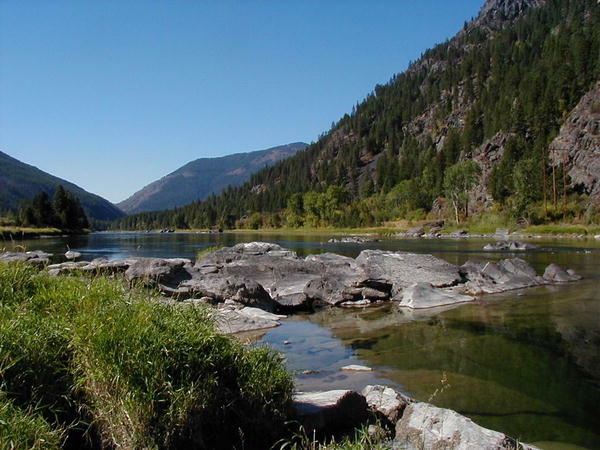 The Kootenai and some of its tributaries are the only waters in Montana where a native strain of rainbow trout, called Columbia River Redbands are indigenous. This species is indigenous only to the head-waters of the Columbia River, including the Kootenai, and is known for its excellent fighting ability. 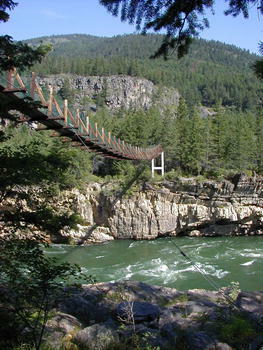 The river varies from big and broad to the rushing waters in the China Rapids Canyon and over Kootenai Falls. The waters between the falls and Libby Dam offer a variety of deep water, shallow rapids and mid-stream islands for fishing access. Many people fish from the banks and islands or use drift boats and float tubes. Consistent angling usually starts around the middle of June and lasts well into November.